South Africa is a land of contrasts and adventures. Compared to small, flat, densely populated and cultivated Denmark, South Africa offers huge wilderness areas with mountains, rivers and wild uninhabited nature. After the Vikings fantastic motorcycle tour in Namibia in 2013 Bruno Gila had now planned a tour for 2014 taking us from Pretoria down to Eastern Cape Province to experience some of the worlds most beautiful off-road areas, with Baviaanskloof and Die Hel as the highlights of the tour. Read more about our trip in the full article. The above photos are by photographer Bruno Gila who was my guide on the tour. Preparations for our Vikings in Namibia tour have now startet, and I'm thrilled like a little child looking forward to something fantastic - something out of the ordinary. We will be 6-8 persons on offroad motorcycles touring 5-6000 km in Namiba on roads like the one shown above and in terrain where roads are not available. We will be sleeping in the bush most of the nights, having only what we can carry on our bikes. Read more about our trip here in the full article (the article will be expanded as our preparations come further). The above photos are by photographer Bruno Gila who will be our guide on the tour. Being introduced to off-road motorcycling in the Romanian Mountain Forrests has been one of the greatest adventures of my life. The terrain is challengeing with all kinds of difficulties to overcome: muddy, slippery, stony, steep, narrow tracks with roots and fallen tree trunks across, with tight bends and frigtening depths alongside and with beautifull and breathtaking sceenery. With grass covered mountain tops and barely passable water streams in the vallies. It has everything and seems to be endless, so the learning curve for a beginner is very steep. A beautifull sceenery which rewards you after climbing up through the steep forrest. I am now writeing up this longer article with lots of pictures and video, so if you want to se more, just click on the link. The "Do It Yourself" Section is growing! I have made Valve Clearance Inspection on my 2008 CBR1000RR Fireblade and shot lots and lots of pictures for Do It Yourself articles. Please enjoy reading, and please use this review thread on www.1000rr.net for any errata, comments and sugestions you may have. 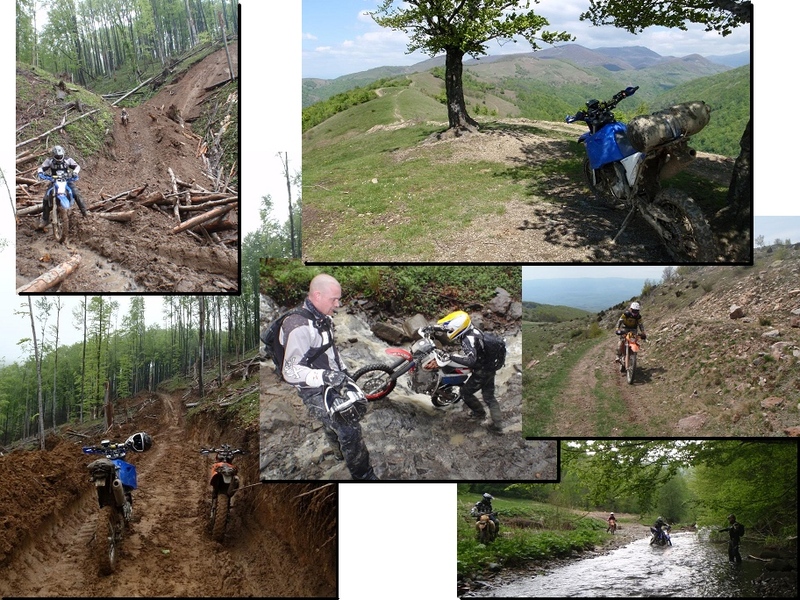 In may I will join a group of Enduro enthusiasts on a trip to the mountain forrests in Rumania. 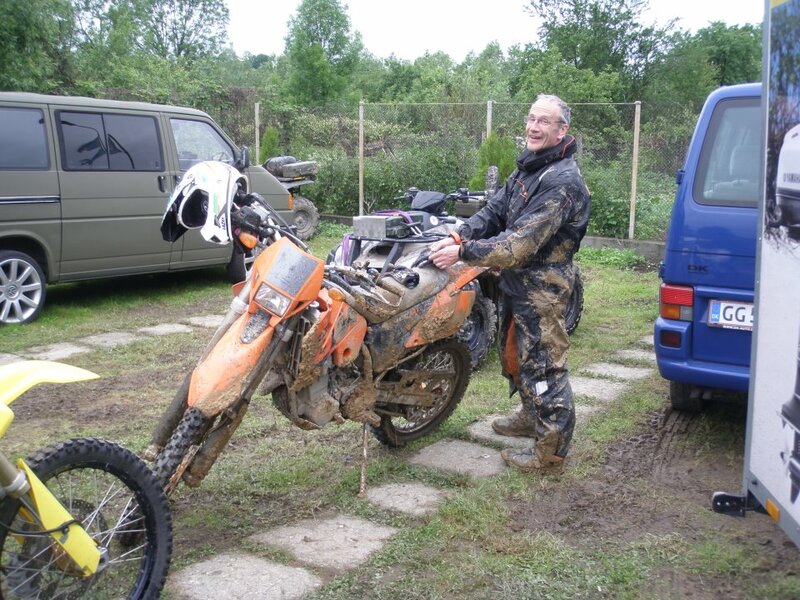 The pictures below are from ealier trips made by theese people, and as you can see it is beautifull and challenging conditions we will meet, especially challenging for me, as I have no previous off-road experience! Igen i år kørte jeg som mc-marshall for Challenge Copenhagen og havde en herlig dag med spændende og alternativ mc-kørsel med Xenia på bagsædet. Xenia havde igen påtaget sig ansvaret for sikkerheden på cykelruten i København city, d.v.s. fra Amager Strandpark til Hellerup. Som noget nyt havde vi hele dagen føgeskab af en motorcykel ført af Rasmus med superfotografen Frederik Jimenez siddende baglæns på bagsædet. Frederik skulle nemlig lave en fotoreportage om Xenia. Det kom der nogle fine billeder ud af! Klik her for at læse hele artiklen. 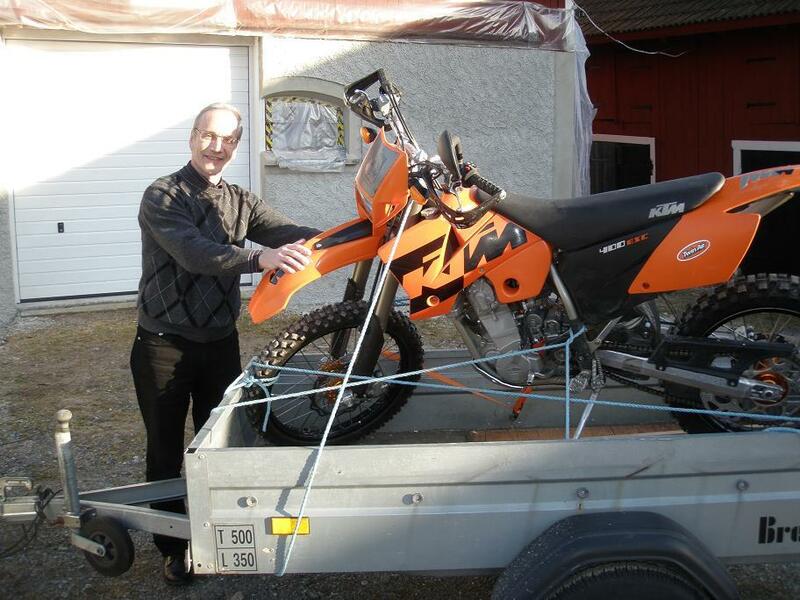 My son Mikkel and I replaced chain and sprockets on my CBF1000A at 40.400 km. This DIY article describes all the details. The image below is from the article and shows that the old chain had elongated 2 links. Having 120 links in total this is arround 1.7 % elongation. The chain was lubricated every 500 to 600 km. It is perfectly possible to skate in the streets of New York! May 25'th I joined the New York Weddensday Night Skaters on a plus 20 km roller skater tour in Manhattan. Starting late afternoon on foot in 94'th street I went to Central Park where I put on my Roller Skates and rolled to the the south end of the park via excellent roads inside the park. A local policeman told me that it was ok to skate almost anywhere - on pavement or in the street. Coming out of the park I continued south via Broadway most of the time running in the street between cars, trucks, busses and a few brave bicycles! Being on roller skates was extremely effective, because I could more or less continuously move forward, either between the traffic lanes or on the pavement. It was a little scary at first, but I soon learned that the trafic is relaxed and that the motorized drivers generally are very carefull when changing lanes, and were always respecting my presence when I was in front of them. Soon I feelt like a real New Yorker, because this was not how other tourists behaved. In fact I did not see other rollers on my way to the WNS meeting point, so skating is probably not quite common among New Yorkers either. After about 4.5 miles I arrived at the WNS meeting point at South End of Union Square Park (14th street), near the stairs in good time before 8.00 pm. The first skaters arrived at 7.30 and soon we were more than 50, among these some in orange WNS t-shirts, they were the staff people. The WNS organizer Mocha led the way much faster than the slowest rollers, but paused here and there, so everybody could keep up. Having no police escorte and not blocking the crossings as we do in Copenhagen FNS, we had to wait on red at traffic lights - at least untill there were no passing traffic (in New York pedestriants - and rollers - pass on red if the crossing is clear - police officers don't even lift an eyebrow for this). I liked this way of setting the pace, because if you want to go fast you just follow Mocha, and if you want to go really fast, you just leave from a pause as one of the last persons and then try to catch up with Mocha. We passed Central Park while the sun was setteling and when we came to Jefferson Park it was utterly dark and quite thrilling to run, because it was impossible to see the surface on which we were running (a small torch would have come in handy here). In general the streats and side walks in Manhattan are excellent for skaters, but there are challenges. Often our route had slopes up to say 5% and there were deep potholes to watch out for. Hence wearing protective gear is a good idea. After 13.3 miles we were back at Union Square Park where arround 20 of us continued to the WNS scater's hang-out bar Mumbles (17th and 3rd). Here Norma resided behind the bar counter serving frittes and beer for the socialising and very thirsty skaters. Two of the skaters - Laura and Chriss - told me that they teach skating at Columbus Circle every thursday evening (if I remember right) so if you are not already a skater - or need to improve your skills - then go there and learn. I had a really joyfull after-skating, talked to many other nice people and after a number of Blue Moons I decided to take a yellow cap back to the hotel. I grew up with tools in my hands and became addicted to technology and anything that moves.